The groups of specialized cells that make up the various human tissues depend on an intricate communication network to regulate gene expression that in turn mediates growth, cell–type specific function, division, and programmed cell death. This network consists of extracellular signals interacting with the receptors of individual cells and determining the fate of each. Since this regulatory system plays a critical role in complex tissue, aberrations or malfunctions often accompany the onset and progression of cancer. Cell Cycle and Growth Control, Second Edition offers both an introduction to important concepts and detailed discussion of regulatory mechanisms at the cellular, biochemical, genetic, and molecular levels. 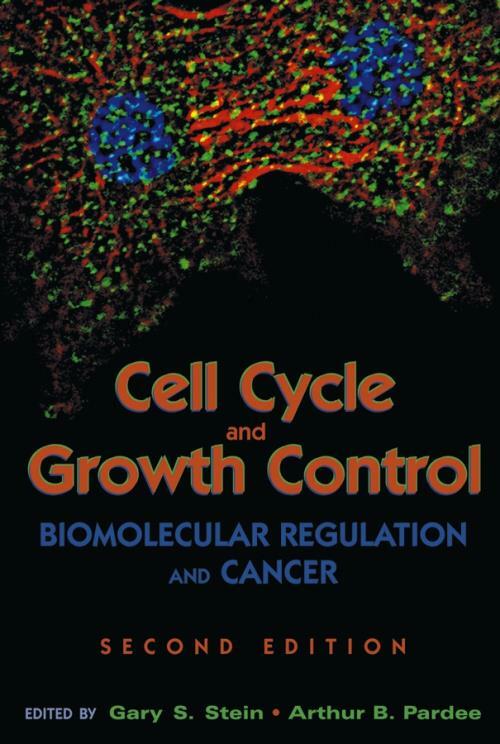 The only book to comprehensively cover both the foundations and cutting–edge advances in understanding cell cycle and growth control, this text also contains an expert perspective on innovative strategies for cancer treatment, making it a vital companion for researcher and clinician alike. 1. Cell Fates (Arthur B. Pardee). 2. Architectural Organization of the Regulatory Machinery for Transcription, Replication, and Repair: Dynamic Temporal–Spatial Parameters of Cell Cycle Control (Corey D. Braastad, Sayyed K. Zaidi, Martin Montecino, Jane B. Lian, André J. van Wijnen, Janet L. Stein, and Gary S. Stein). 3. Cell Cycle Regulatory Cascades (Heide L. Ford, Robert A. Sclafani, and James Degregori). 4. Membrane Receptors and Signal Transduction Pathways in G1: Regulation of Liver Regeneration and T Cell Proliferation (Joseph F. Porter and David T. Denhardt). 5. Onset of DNA Synthesis and S Phase (G. Prem–Veer Reddy, Eugenia Cifuentes, Uma Bai, Mani Menon, and Evelyn R. Barrack). 6. The Progression and Regulation of Mitotic Events (Greenfield Sluder, Edward H. Hinchcliffe, and Conly L. Rieder). 7. Cell Cycle Inhibitory Proteins (Carmen Carneiro and Andrew Koff). 8. Chromatin Remodeling and Cancer (Cynthia J. Guidi and Anthony N. Imbalzano). 9. Extracellular Matrix:Tissue–Specific Regulator of Cell Proliferation (Aylin Rizki and Mina J. Bissell). 10. Angiogenesis and Blood Supply (Judah Folkman). 11. Regulation of Cell Growth, Differentiation, and Death during Metamorphosis (Hans Laufer and Eric H. Baehrecke). 12. Translational Control and the Cell Cycle (Robert E. Rhoads). 13. Telomere Structure and Function Provides Insights into the Generation of Genomic Instability and Carcinogenesis (Colleen Fordyce and Thea D.Tlsty). 14. Immortalization by SV4O Large T Antigen (Rowena L. Lock, Silvia Benvenuti, and Parmjit S. Jat). 15. Apoptosis Signaling in Normal and Cancer Cells (Shulin Wang and Wafik S. El–Deiry). 16. Mutagenesis, Mutations, and DNA Repair (Roger D. Johnson). 17. Oncogenes (Stacey J. Baker and E. Premkumar Reddy). 18. Role of the Retinoblastoma Family in Cell Cycle Progression and Growth Control (Valeria Masciullo and Antonio Giordano). 19. p53 Tumor–Suppressor Genes (Faith A. Zamamiri–Davis and Gerard P. Zambetti). 20. Cell Cycle and Growth Control: Current Clinical Applications (Michael Deininger). 21. Misregulated Fate Cancer (Arthur B. Pardee).